This is my favorite section of a Japanese song written by Keizo Horiuchi called Fuyuno Seiza / Winter Astronomy. All of a sudden, one day, an oscillating long-tailed comet appear in dark sky. As I learn how the space is created and developed, I reflect on human life—how fragile our lives are. Many centuries of life forming on Earth, I believe that they all originated from stars. They came from the stars and they go back to the stars in the end. 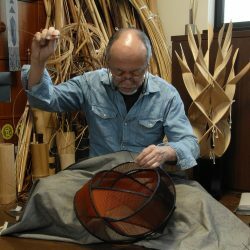 I work with bamboo every day, and through this medium, I express celestial world which I consider as foundation of my life. I would like to convey to viewers how precious life is through observation of this alluring material, and think about beautiful stars and sublime cosmic space. By Architectural Digest, Contributor 09/23/2015 (photo: William Abranowicz) In the master bedroom of this St. Barts hilltop house, Kang Chang of KangModern designed the desk and stainless-steel light fixture; the desk chair is by Cassina, the armchair is by Pollaro, and the sculpture is by Fujitsuka Shosei.